If you're into Star Wars Episode VII: The Force Awakens spoilers, you're probably still recovering from that rumor from earlier this week. Well, today we have another one for you that, while not a devastating as the earlier one, is equally huge. This, of course, comes from our friend Jason Ward over at MakingStarWars.net who gets this information from his various sources. As usual, there is a chance this may not be true, but if you are avoiding all The Force Awakens spoilers then stop reading now. This is your official SPOILER ALERT! The heroes suffer a great blow when they lose their mentor figure. But after a great duel with Rey and Finn versus Kylo Ren, the heroes return back to the base as heroes. At this point, it becomes clear that their current adventure together has come to an end. We follow our main hero, Rey as she says goodbye to the important players in the film, Leia, Poe, and so on. Meanwhile BB-8, Artoo-Detoo, and See-Threepio decode a puzzle. Rey makes a special stop to say goodbye to Finn in the medical bay. Rey, Chewbacca, and BB-8 then get into the Falcon and take off. Chewbacca playfully messes up her hair in an endearing gesture. Things are going to be alright, is what the Wookiee is trying to say, as far as I can tell. I imagine like all Star Wars films, the end is silent with music playing. That’s just my take though. But it seems likely here. Rey walks up the stone steps. She comes up to a figure and puts the Lightsaber in his hand. Its Luke Skywalker. That’s what Luke does. He gets his lightsaber back. He apparently finds an apprentice. 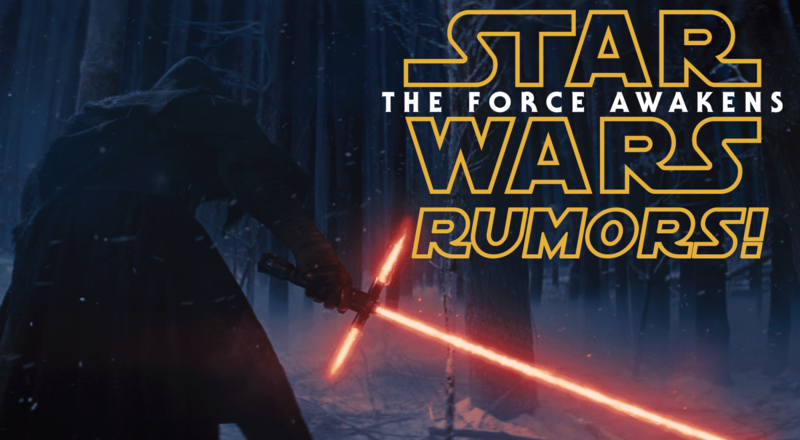 It appears Luke Skywalker is very much an artifact being saved for Star Wars: Episode VIII. This is a first. I think we'd all been assuming that Luke Skywalker would have a more sizable role in the film than this. I wasn't expecting Luke to be the focus of The Force Awakens, but I did expect we'd see him more of him than this. That being said, it would make for a cool scene, and a great teaser for what's to come in Episode VIII. It also lines up with some of my speculation that Han will be the old Ben of the sequels (in that he helps the new generation get started on their journey and is the member of the previous generation who is in the spotlight in the first film of the trilogy) and Luke will be the Yoda (in that he is responsible for a lot of the training and is the member of the previous generation who is the spotlight in the second film). The other surprising thing would be the fact that Mark Hamill was on set for so long! He was there basically the whole time which fed the speculation that he would have a sizable role in the film. Could him having been there been a red hearing to keep us off the scent? I struggle to believe that. There are lots of conspiracy theories surrounding films like this that stuff is shot that will never be used, but that rarely turns out to be true (I honestly can't think of a single example). The simple truth is we will have to wait and see on December 18th, 2015. I'm not buying it. This sounds like the equivalent of Sam Jack as Fury in the first Iron Man.A cameo. A teaser. Which was great for that film because THERE WERE NO EXPECTATIONS. Pull that with TFA? Don't even hint at Skywalker until the last 5 seconds of the film? The fans will be in full revolt, especially after killing off Han. This really sounds more like fanfic than an actual moment in a real film. Mark spent an awfully long time in England to film just a few days. He was there months, and I don't think he was simply vacationing. BS BS BS! Sorry. It just is. There's literally no way this is true. Disregarding all other spoilers that have Luke more involved there's no way JJ would green light arguably one of the biggest draws of the franchise having a three second cameo. Star Wars is about the Skywalker legacy. These new movies may take some of the focus off of that (Gleeson as a Skywalker rumors aside) but they wouldn't go this far. Not a chance in hell. I don't think this is true, and I really hope its not. Luke is my favorite character and his total absence would really be a cruel tease after such a long wait to see his return. I definitely think they are saving him for a surprise in the back-half of the film, but I don't think they would make him just an end-scene cameo. We just had a rumor that said Kylo Ren is injured after fighting with Luke and the other cast members and now Luke is only at the end, i don't buy it. Red herring, not red hearing. I really don't think Star Wars need to continue, it has a beginning and an end, that's all! This is going to screw it for sure. Silly nonsensical spoilers. It would make zero sense to not have Luke play a sizeable role in this movie. Zero. Caique, if you don't think Star Wars needs to continue, then there is no point in you being here. Mark spent three days in Ireland shooting also. This smells like pure BS. These spoilers, if true, are making for a horrible plot. This sounds like a cheese fest. Hamill was also starring in kingsman the secret service wasn't he not?